If you have a Business, Business Plus, or eCommerce plan (U.S. only) , you can add Google AdSense to your website. AdSense matches text and display ads to your site based on your content and visitors, and pays you for ad space on your site. For more info, visit https://support.google.com and click AdSense. Note: To sign up for Google AdSense, you need a Google account. The feature's available for U.S. customers only. Click Edit Site, select Site Settings, and then click Display Ads. If you don't have an AdSense account yet, click Sign Up for Google AdSense and follow the instructions to set up an account. 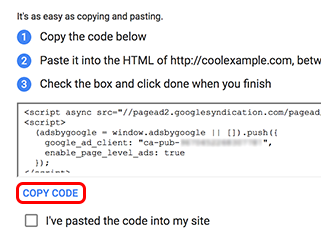 If you already have an AdSense account, click Help me find my AdSense Code, and then follow the instructions for How to get and copy your ad code. When you're prompted to copy and paste a block of HTML code, click COPY CODE. 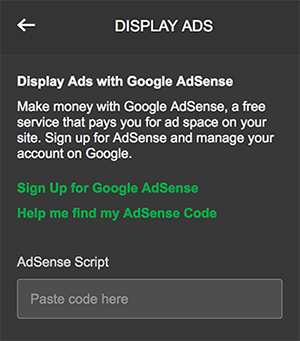 Back in your website, paste the code into the AdSense Script box. Your changes are saved automatically. It may take up to 48 hours for ads to appear after Google approves your website. Note: Be aware that visitors to your site may not see the ads if their web browser uses a web ad blocker.